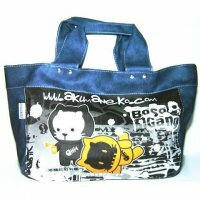 Boso Gang Skulls Blue Handbag , Large Handbags , Bags : Starscastle Online Shop: Cute Bags, Accessories, Kawaii Stationery, Cool Wallets, Fashion Jewelry & More! Funky design Boso Gang skulls image on the front. Back of bag is blue denim color. Cute roomy bag for any occasion - work, school, or vacation.